Sometimes it's OK to get a little starry-eyed. That was the case Monday night in Tempe at the Discovery Mission Celebration of the Psyche and Lucy missions, where scientists, support staff and guests explored Arizona State University's roles in Psyche — the first ASU-led deep-space mission — and Lucy, which will carry an instrument designed and built on campus. The mood was festive and focused on possibilities. The Psyche Mission will explore a metallic asteroid that may be the core of an early planet, giving us a glimpse into what may lie at the core of Earth. “We’ve never visited a metal world, and we’ve never seen Psyche as anything other than a speck of light,” said School of Earth and Space Exploration Director Lindy Elkins-Tanton, the mission's principal investigator. 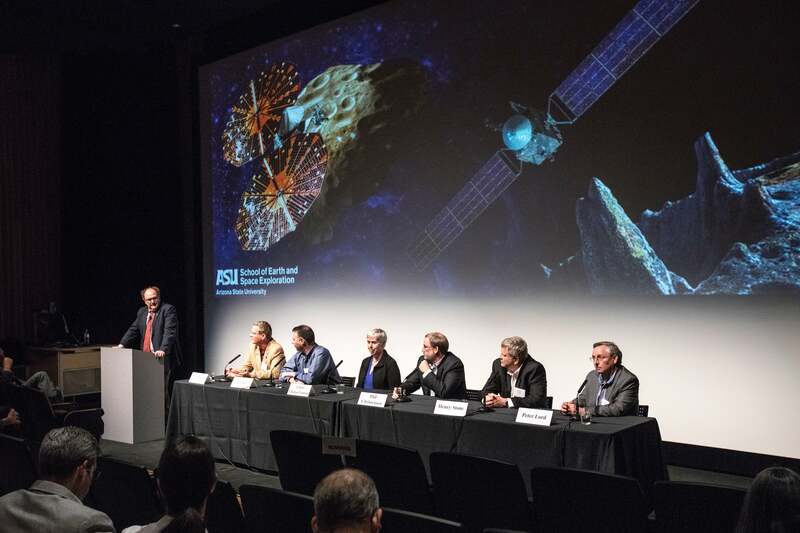 The Lucy Mission, which will investigate Jupiter's Trojan asteroids, will carry a thermal emission spectrometer designed and built at ASU. Regents' Professor Phil Christensen is the instrument's designer and principal investigator; he discussed Monday evening how the ability to build space instruments on campus allows us to pique the interest of students and the community. See more of the sights and sound bytes in the slideshow below.